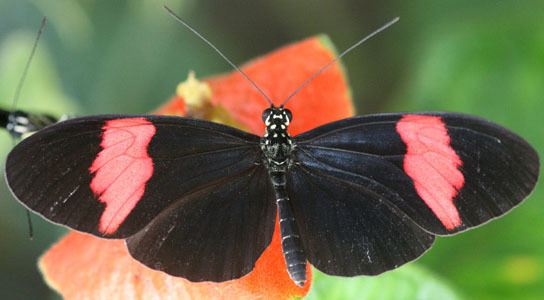 While studying the genome of the Postman butterfly and examining the genetic makeup of two other closely related butterfly species, a team of international researchers found that the species share the parts of their DNA that deal with color patterns as a result of hybridization. A landmark effort to sequence the genome of a South American butterfly has revealed the key behind its ability to mimic other butterflies. A first for science, the genome sequencing work is the product of an international group of researchers, dubbed the Heliconius Genome Consortium, who examined the genome of the Postman butterfly (Heliconius melpomene), a well-known species that lives in the Peruvian Amazon. Using that data as a guide, they then examined the genetic makeup of two other closely related butterfly species – Heliconius timareta and Heliconius elevatus. The three species were selected for the study because they share similar color patterns on their wings as a way to ward off predators. The consortium’s surprising finding, as described in a paper published May 16 in Nature, is that the species look similar because they share the parts of their DNA that deal with color patterns. The genetic sharing among species, researchers believe, is the result of hybridization. Considered extremely rare, particularly in animals, hybridization occurs when two different species interbreed in the wild. The resulting hybrid offspring share traits with both mother and father. Though often considered evolutionary dead-ends, hybrids occasionally interbreed with a parent species, in the process introducing new genes that can help populations adapt to new or changing environments. “What we show is that one butterfly species can gain its protective color pattern genes ready-made from a different species by hybridizing [or interbreeding] with it — a much faster process than having to evolve one’s color patterns from scratch,” said Kanchon Dasmahapatra, a postdoctoral researcher at the University College London’s Department of Genetics, Evolution and Environment, and a co-author of the paper. A total of 80 researchers in 32 research universities and institutions from eight countries worked on the genome project, while a subset of nine laboratories funded the sequencing of the 290 million DNA bases using high-throughput technologies, allowing the work to proceed without major dedicated grant funding. Sequencing work for the consortium was carried out at the Baylor College of Medicine, which performed the main reference sequence, and at the University of Edinburgh, GenePool, where the resequencing was performed. Be the first to comment on "Butterfly Research Reveals Genetic Sharing from Hybridization"